Fight Back is a powerful immune system support supplement designed to help natural immune function. Powerful support for the immune system helps enable a strong immune response when animals are challenged by infections or allergens. Fight Back is best fed daily when used to target an existing issue. For best results, feed Fight Back for a minimum of 7-10 days. Most will see results within days; however, this will depend on the severity of the condition. Please use the teaspoon enclosed. * Some people ask us what is meant by "Yeast extracts". They are the key concentrated nutrients required for cell division and can easily run short in modern diets, especially when an animal is injured or under attack from infective organisms or allergens. An inability to produce billions of new cells rapidly impairs the natural healing or immunity responses (primarily the production of white blood cells). So Fight Back is designed to enable these functions to be carried out as nature intended. We recognise that some animals are allergic to some of the components of yeast products. 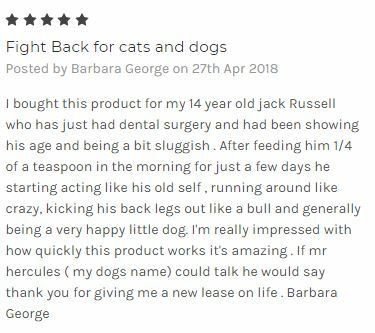 We are not aware of any negative allergic reactions to Fight Back and yet we have lots of feedback about the positive effect keeping animals allergy free. However owners of yeast intolerant animals are advised to introduce Fight Back slowly. The key nutrients we use are routinely incorporated into products designed for young animals and indeed have been used in human milk replacing powders for over 20 years. If you do not wish to feed your pet anything that you cannot identify precisely then we respect your right not to buy Fight Back. Due to the time and resource we have spent in developing this product, we are keen to keep our recipe secret. Please respect our right to maintaining our hard earned trade secrets, which incentivises us to invest in R&D and product development. This product works great for our two mini pomeranians allergies and their overall stomach wellbeing (a lot less upset stomachs now). But I give it a 4/5 star as it is yeast based, and anything yeast based does have the possibility of making allergies worse in dogs sensitive to yeast. Excellent formula, It has helped relief my English Staffy who has grass allergies & the yeasty paws. It made his fur nice & soft also cleaned out his system for the first 5 days of using. His paws & ears are not as red & he has stopped licking them which is amazing!! Thank you very much for bringing out a product that doesnt harm the animals & also with fast results. A great product for my Jack Russell who has hay fever. Been using it for years now. 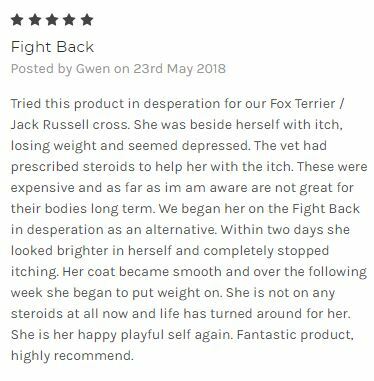 Tried this product in desperation for our Fox Terrier / Jack Russell cross. She was beside herself with itch, losing weight and seemed depressed. The vet had prescribed steroids to help her with the itch. These were expensive and as far as im am aware are not great for their bodies long term. We began her on the Fight Back in desperation as an alternative. 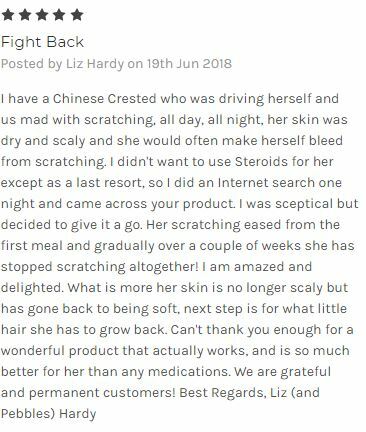 Within two days she looked brighter in herself and completely stopped itching. Her coat became smooth and over the following week she began to put weight on. She is not on any steroids at all now and life has turned around for her. She is her happy playful self again. Fantastic product, highly recommend.